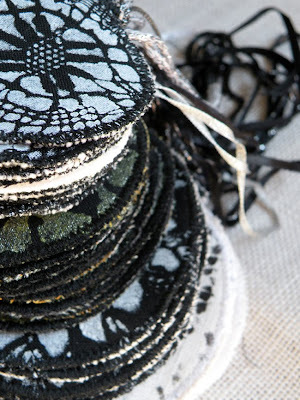 What would you do with fifty-odd black and white handmade fabric ornaments? Especially if you had them because a PR agency in London ordered them but never paid. Well, it happened to me, and I was so disappointed last year that I packed them away, carefully flat, all lined up in a bag and placed them at the bottom of my fabric basket. And there they lay until a few days ago. It all started with a message on etsy last year from the PR agency, mid-November. They liked my nostalgic fabric ornaments printed with vintage lace. 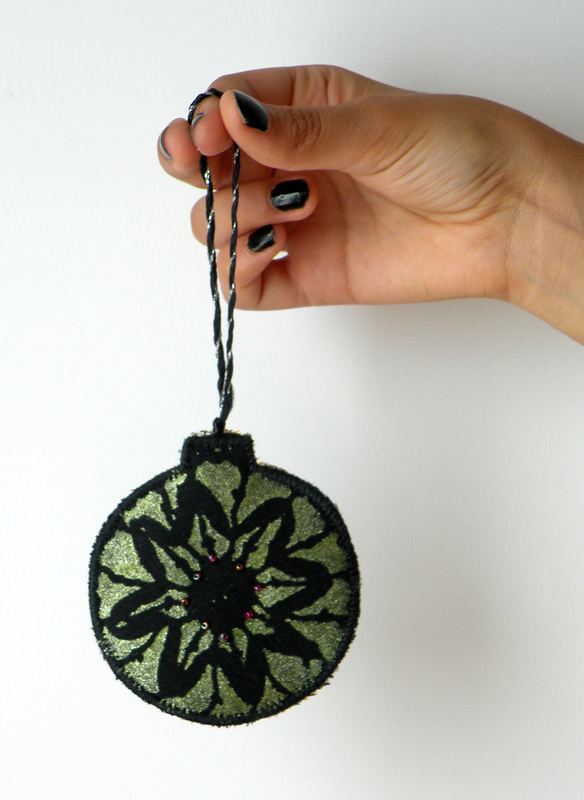 Would I be interested in creating about 50 bespoke ornaments for a gala being held for British interior designers on December 9? The client was a non-profit organization working to build awareness about saving energy in the design field. A well-known designer was associated with the project. 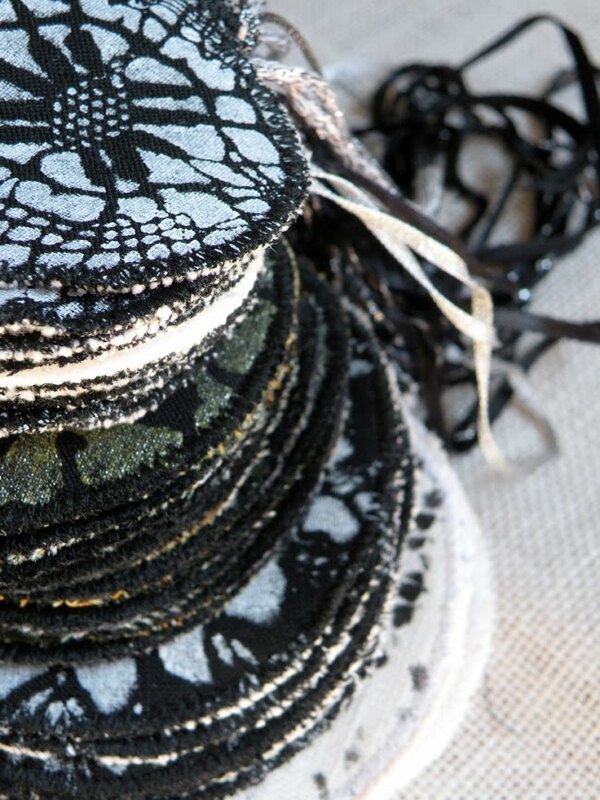 A rock star in her younger days, she now creates clothes and home deco items in black and white lace. 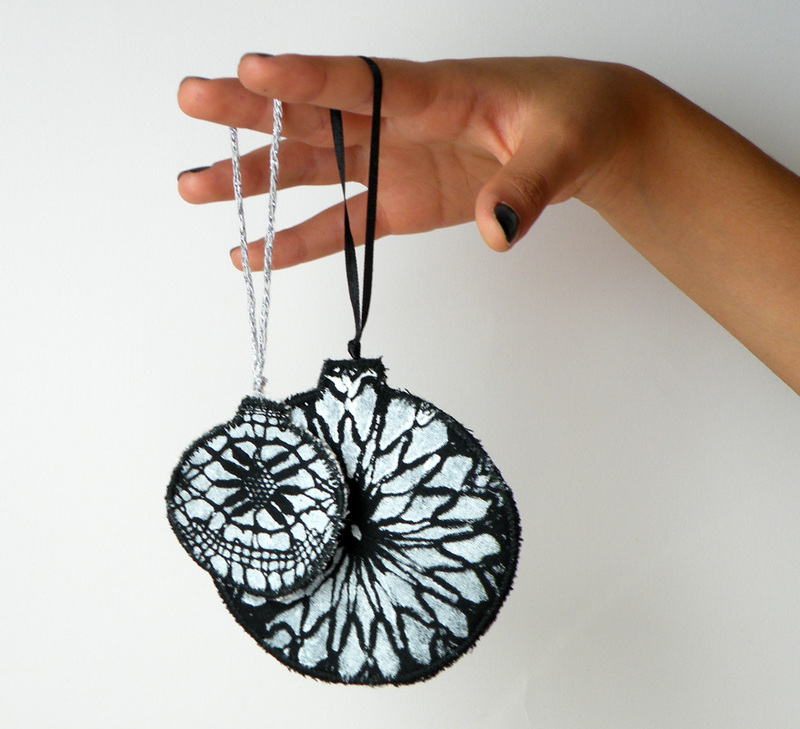 My ornaments were to match her style, and at the gala, the designers would receive one in their press packets. I was already imagining the designers discovering their ornaments at the glamorous evening event in London! • I received a brief for artists. • I sent in a cost estimate and photos of samples. • My contact person at the agency loved the samples, but I had to wait for approval from the client, who was considering a few artists. • I reminded them that I'd have to ship by December 1. • My contact person went on holiday! • I phoned London and spoke to my new contact person who assured me the client would decide in a few days. • I got word that the client loved my work and wanted them. • I finished sewing them up. • I sent a polite reminder that I couldn't ship without first receiving payment. And then, just like that, no more word from the agency. December 1 came and went. Nothing. I think it was an honest miscalculation in timing on their part. They realized that the ornaments would never get there in time. But a message from them would have been nice. So, I swallowed my disappointment, packed up my ornaments and put them away. The other day, I found them in my basket and had a fun photo session with my daughter! Regrets? Not really. I had a good feeling about the project and went with my intuition. It was for a good cause. I gave it my best effort, but it just didn't work out. What am I going to do with black and white Christmas ornaments? Not exactly Christmas colors, you say? 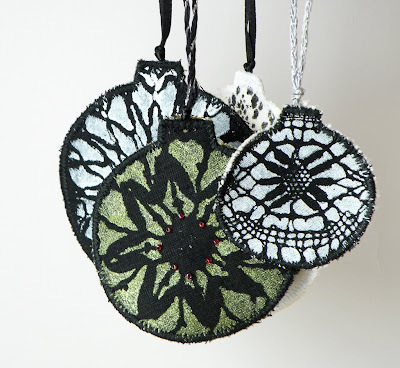 I'd love to hear your ideas in the comments section, and from the people that mention ideas, I will randomly pick 2 people who will receive a set of four assorted ornaments, shipped anywhere in the world. Don't forget to leave your name & e-mail address.